So you turn up at the airport and find that you have stupidly inadvertendly deliberately left your Boarding pass at home. Assuming it is not with your passport, you usually dont have a problem! For example, in the USA, you can rock on up to a machine and get a new one printed. In other countries, a human usually has to issue you with a new one. 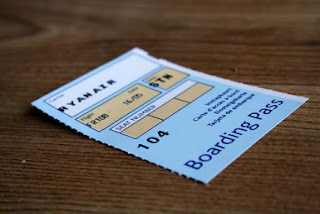 Not so easy with Ryanair who has decided you must print your own pass at home. Forget to do so and Ryanair make you pay for a new one. Remember this is Ryanair, the airline that charges for everything they can. The same Ryanair I put as the sixth worst airline in 2010. So how much would you expect for them to print you a Boarding Pass? 5 eruo ($US7ish £4.25) ? 10 euro? TRY 40 Euro (almost $USD55 or £34!!!!). In some cases this may be more than the fare! A Spanish judge Barbara Maria Cordoba has thwarted this in Spain saying saying: “The normal practice over the years has been that the obligation to issue the boarding card has always fallen on the carrier. I declare unfair and therefore void the contractual clause in which Ryanair obliges the passenger to be the one who brings the printed boarding pass to travel or face a penalty of €40.” First round to the public….stay tuned for Ryanair next play.